ABOVE: The basic geodesic structure in place. Photos courtesy of Mad Systems. One interesting new development we came across recently when designing and installing a system for one of our clients was the negative pressure projection dome. A negative pressure dome is based on a geodesic dome that is built using rods that slot into interconnecting custom pucks. A structure with a near-ideal spherical shape results. An outer layer of material is then stretched over this structure, and an inner projection screen is mounted inside of the geodesic structure and connected to the outer surface. The air in the space thus created is then pulled out using a very quiet pump, and the resulting reduction in pressure (negative pressure) then causes the inner projection screen to be pulled towards the geodesic structure. The shape of the tensioned projection screen is such that this provides a semi-rigid surface that very closely approximates a dome shape, onto which images can be projected. 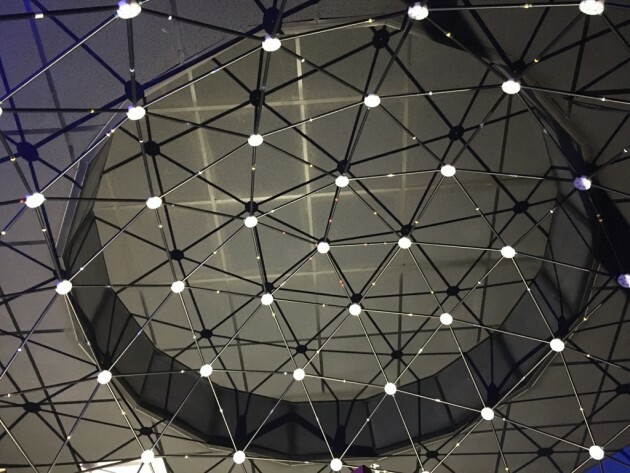 This method, a new way to provide a dome-shaped projection surface, turns out to be a rather nice and a very affordable dome theater solution (often referred to as “fulldome”) for museums, visitor centers and a host of other venues. Think about gaming, dark rides, 360-degree cinema and simulation. Use it to do a theater performance, surrounding your audience with imagery without needing any physical set changes. Surprise your guests by setting up a dining location where you take them into another space. Have a party, and use the dome to completely surround your audience as you dance the night away. Consider presenting your new building or gallery design such that it properly surrounds your audience. Experience a rock concert, or consider this for just about any application where you want your audience to be completely submerged in your story. From aerospace to ocean depths, possibilities abound. A lowcost solution, it provides a number of distinct benefits when compared to other dome theater solutions. To start with – it doesn’t need a dome-shaped building or another huge custombuilt space – it will fit right into your venue (or outside it), and it’s free-standing. These domes are essentially ‘portable’; moving one around is certainly an option. Getting the basic structure built and the dome in is normally between a day and a few days of labor with another day or so to get the equipment in, finessed and your staff trained. The projection system provides at least 3K video into the dome, and with the included surround sound audio system, the result really can be rather stunning. Basic size options range from a diameter of 10’ up to well over 100’ diameter, with seating capacities up to nearly 1,000 visitors and standing room for considerably more. Video resolutions range from around 3K up to 8K, depending on the size of the dome and the projection hardware installed. Lower cost options typically include conventional projectors, but laser projector options are also available. Options to use PVC, fiberglass or solid aluminum panel outer shells exist, so domes for outdoor use are available as part of the repertory. The decorative dome cover can be customized with full color printing, making for a very attractive exhibit. In the case of our installation, we used a simple black cover that makes the dome disappear into the ceiling and is hardly seen. A completely free-standing dome can be supplied and installed with a variety of different door options and even heating and cooling should it be required. Controlling the dome is simplicity itself. Using an iPad with several options including an automated play-list feature means that you do not need a full time operator. Should you want for someone to present a show or show sequence, it’s easy: since the controller is portable, there is no need for a fixed operator position. The presenter or docent is free to join the audience and present from wherever works for them. The total weight is relatively minor. No huge structures or vast amounts of infra-structure are required. For this installation we mounted a 15’ diameter aluminum ring into the space, and built the geodesic structure on top of that. Power requirements for this dome were minor, and the dome comes with everything you need to get it up and running. A 10’-15’ diameter dome only needs a single main socket. Another nice plus point with this system is that there is no longer a need to have equipment sitting in the middle of the room, as the projectors are mounted on the rim of the dome. This means that it is quite acceptable to have it as a free-standing exhibit that just runs movies or tells a story. Guests can walk in and out; there is nothing in the space that people can trip over. Once the projectors are installed, calibration of the imagery onto the dome is a breeze: A camera is set up in the middle of the dome for the calibration process, and a couple of button presses later the alignment is done and perfect. Another nice feature is scalability. With a height requirement that is marginally over half of the diameter, and various different sizes being viable options, there is always a dome that will fit. In fact, even in cases where the remaining space below the dome might be marginal, there is usually no reason not to tilt the dome, and adjust the seating accordingly. Even in rooms a little over 10’ high there is an option to use a small dome to provide an immersive viewing environment. It is also easy to add another dimension – adding moving seats and special effects is quite feasible and relatively simple as there is no dome equipment to get in the way. In the past, providing media for a dome has been expensive – but this is no longer as much of an issue. With a horizontally mounted dome and visitor seating arranged in a circle, it is obviously still important to provide media that looks good and is relevant no matter from which location it is viewed. However, with a tilted dome, and seating arranged on one side of the dome, this is much less of a concern. The dome we installed comes with a few short movies and a host of sample movies, and more material is available including the obvious space based media, but there is also a range of other interesting and good looking movies. Samples of electron microscope based imagery had the audience reacting well, and asking for more, and shoots of the Albuquerque Balloon Festival provided for a really nice alternative. Thousands of other titles for a range of genres are available, and with a movie conversion facility for (ideally) 4K material, it is easy to show client provided or purchased material in the dome. Our client obtained free content from NASA and converted it for the dome. With more and more 4K material being available, and wide angle lenses and 4K cameras likewise, even custom shoots are getting more affordable. An add-on computer provides for a planetarium type capability. The “Event Horizon” software that was provided as part of this particular package allows for a host of basic planetarium-like functionality, with images of stars, the Milky Way and options to overlay names. You can control the magnitude of stars to be shown. Images of animated planets and planetary orbits are all part of this software, and covers all the basics. Event Horizon, however goes a lot further. It allows for options to see the sky not only in the visual domain, but in different spectra ranging from gamma-ray imagery to infra-red with a number of options in the middle. It is easy to control too, with the same iPad that is used to control all the other functionality of the dome. If this software is not enough, or if your educators have their own preference for an astronomy package, the computer that runs this software is Windows based, so that it is possible to install any of the ‘usual’ (and mostly free) astronomy software including Worldwide Telescope, Celestia, and any other suitable software package that you are used to working with as we did for this installation. Maris Ensing is CEO of Mad Systems, a technology company specializing in audiovisual and interactives, based in Orange, California, with an office in Beijing, China. Visit www.madsystems.com.